View of collapsed Second Narrows Bridge. 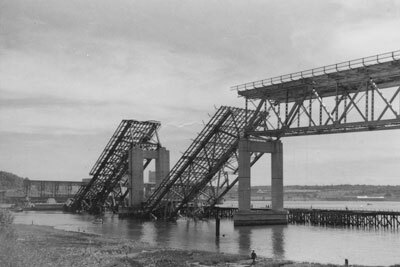 Bridge collapsed during construction on June 17, 1958. The bridge was renamed to Iron Workers Memorial Bridge in memorial to the workers who died when the bridge collapsed.Photo shows two cement pylons with two steel girders collapsed and laying in water. East Vancouver in background.